Cleansing balms are yet another game-changing addition to my beauty routine since making the switch to natural products. My first full-sized escapade into the world of cleansing balms was the Balance Me Cleanse and Smooth Balm (125ml RRP £20.00). It very quickly became one of my favourite beauty products and I even featured it in my Best Natural Beauty Products of 2013 - it's that good! Being a bit of a newbie to balm cleansers at the time, the consistency did take me a little while to get used to at first! It's an oil-based balm containing rosehip, sweet almond, kukui, camellia and coconut oils, all of which make easy work of cleansing, removing make-up and softening the skin. The balm also contains tiny little pieces of oatmeal to gently exfoliate and encourage cell renewal as you cleanse. To use, you just smooth a small amount of the balm over face and neck in circular motions for about 30 seconds, then add some warm water (it turns slightly creamy at this point) and continue massaging for another 30 seconds or so. You can even gently wipe it over eyes too, just be careful not to get it in your eyes - trust me, it's not the best of experiences having gritty oatmeal in your eye!! To finish, simply wipe away the residue with a flannel or the muslin cloth provided. Unlike a lot of other cleansing balms, this one comes packaged in a squeezy tube which is a lot more hygienic than scooping out of a tub. Although that might make it seem travel friendly, I did find it leaked slightly through the cap when I tried travelling with it - I've not heard of anyone else with this issue though so it may have just been my particular tube! The Cleanse and Smooth Balm has been the perfect companion throughout the winter months, thoroughly removing all my makeup and keeping any dry patches at bay. I've just finished my tube yesterday after using it 4-5 times per week for over 6 months, so at a cost of £20 I think it's well worth it and great value for money for how long it has lasted! It's safe to say I love this product and I will definitely be repurchasing in the future! 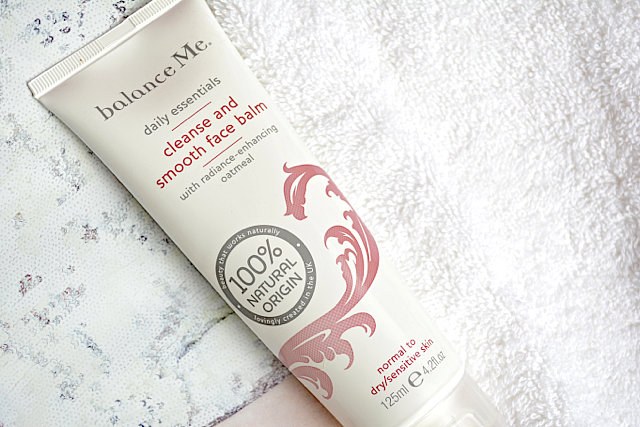 Have you tried Balance Me's Cleanse and Smooth Face Balm before? I might link yours to mine so people know it's not all bad as I didn't want to put people off! I love organic pharmacy carrot butter cleanser though atm :) but I'm nearly finished. I've not tried a cleansing balm before. I think it would take me a while to get used to the consistency like you because I've only ever used cream cleansers. That's amazing that it lasted six months! I've been wanting to try cleansing balms for some time now. But now that its approaching summer I think that a cleansing balm might have too much moisture. What do you think? Are cleansing balms better suited during the winter? Also, I'm sad that this one contains coconut oil! My skin reacts very badly to it for some reason. I've never tried cleansing balms before and this sounds really interesting! Great review! Oooooh been curious about this one...do you have to double cleanse with it?